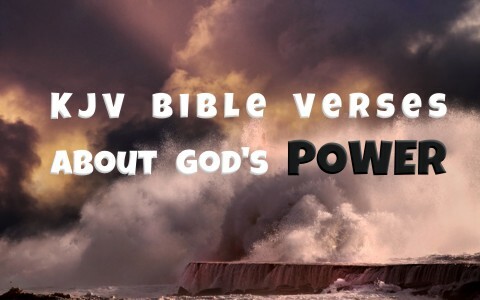 Take a look at these great KJV Bible verses about God’s power. Psalm 65:5–7 By terrible things in righteousness wilt thou answer us, O God of our salvation; Who art the confidence of all the ends of the earth, and of them that are afar off upon the sea: Which by his strength setteth fast the mountains; Being girded with power: Which stilleth the noise of the seas, The noise of their waves, and the tumult of the people. Luke 8:24–25 And they came to him, and awoke him, saying, Master, master, we perish. Then he arose, and rebuked the wind and the raging of the water: and they ceased, and there was a calm. And he said unto them, Where is your faith? And they being afraid wondered, saying one to another, What manner of man is this! for he commandeth even the winds and water, and they obey him. Romans 1:4–7 And declared to be the Son of God with power, according to the spirit of holiness, by the resurrection from the dead: By whom we have received grace and apostleship, for obedience to the faith among all nations, for his name: Among whom are ye also the called of Jesus Christ: To all that be in Rome, beloved of God, called to be saints: Grace to you and peace from God our Father, and the Lord Jesus Christ. 2 Chronicles 25:8 But if thou wilt go, do it, be strong for the battle: God shall make thee fall before the enemy: for God hath power to help, and to cast down. Romans 16:25–27 Now to him that is of power to stablish you according to my gospel, and the preaching of Jesus Christ, according to the revelation of the mystery, which was kept secret since the world began, But now is made manifest, and by the scriptures of the prophets, according to the commandment of the everlasting God, made known to all nations for the obedience of faith: To God only wise, be glory through Jesus Christ for ever. Amen. The source of all power is God and even in our darkest moments when we recognize this truth God will bring us up out of the miry clay and set our feet upon a rock (Psalm 40:2). And that is not just any rock. That is The Rock of salvation that we find only in Jesus! Previous post: What About Christians Who Live Like The World? Are They Saved? Next post: What Are Some Myths About Pastors?